Hello again world. It's been too long since I last posted an entry. Somehow, finding the time to write more than 50-75 words about my winemaking activities has been challenging so I've been doing most of my updates on Facebook. Find and follow Aaronap Cellars on Facebook for all of the last minute details on the fun that goes on in the cellar, especially as I start filling out paperwork for the commercial licenses in the coming couple of months. But I'm celebrating a little anniversary this month. It's been 15 years since some good friends introduced me to wine in grad school (I'm looking at you Bruce, Randy, & Sonja). Hard to believe that just a short while ago, I was a wet-behind-the-ears country bumpkin that hated the only glass of wine I had ever tried. I still remember that very first chardonnay tasting at Bruce's apartment where I showed up with a beer mug when told to bring a glass! Boy, times, tastes, & glass collections have changed! While thinking back over the past 15 years, I've been amazed at the sheer variety of wines that I've tasted along this adventure. French, Italian, Spanish, Portuguese, German, Greecian, South African, Chilean, Argentinean, Australian, New Zealand, and the myriad of US wine regions--whew! Makes my taste buds purr with pleasure just thinking about it. In recognition of the adventure that I've been on, I thought I would chronicle my tasting adventures over the next year and document all of the different wines that I taste (or at least as many as I can). I'll still keep writing updates on my winemaking, but will somehow figure out how to keep a rolling record of all the wines. To start, on Wednesday 10/12, I had the privilege to attend "The Brilliance of Burgundy Tasting" at Brix on Broad in Boston's Financial District. I was a little underdressed for my tasting peers, but we enjoyed a number of showcase wines from France's Burgundy region. 2009 Vocoret Chablis ($27): OK, this ain't from Burgundy, but was a great greeting wine to get people into the spirit. Crisp, fruity, & full bodied. Very nice Chablis. And to top off the evening, they poured the best wine I've ever had to date. Completely blew my mind and set the bar for all future white Burgundies (and chardonnays everywhere). 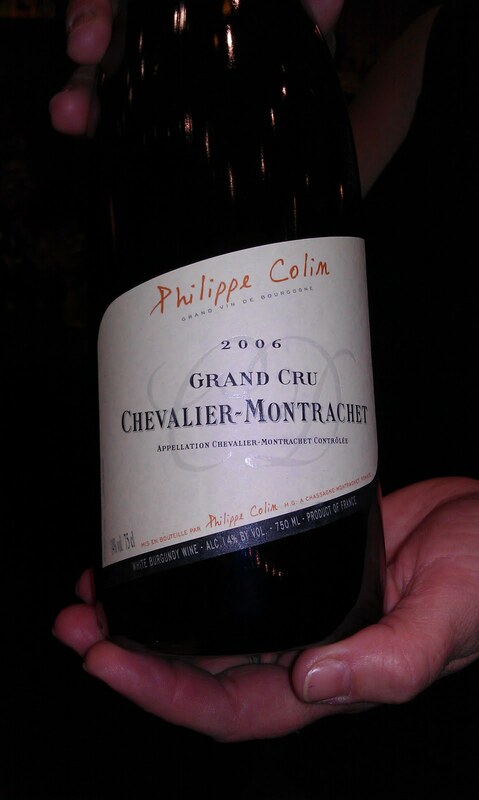 2006 Philippe Colin Chevalier-Montrachet ($265): Smooth fruity nose with mellow caramel notes that just slides over the tongue. Silky smooth with a slightly "sweet"-tasting finish. Lingers long after the sip is gone. AWS score: 3/6/6/3/2 = 20. That is a pretty cool shop. I haven't been in there in a while. Looks like some nice wines to taste. AWS Hudson Chapter October Tasting "Rioja"